Scientists at Dana-Farber Cancer Institute have found a way to disable a common protein that often thwarts chemotherapy treatment of several major forms of cancer. The researchers discovered, surprisingly, that they could exploit a small portion of this anti-death protein, called MCL-1, to make a molecular tool that specifically blocked MCL-1's "pro-survival" action, allowing standard cancer drugs to kill the tumor cells by apoptosis, or programmed cell death. "We think this is a very important step toward developing an inhibitor of MCL-1, which is emerging as a critical survival factor in a broad range of human cancers, including leukemia, lymphoma, multiple myeloma, melanoma, and poor-prognosis breast cancer to name just a few," said Loren Walensky, MD, PhD, a pediatric oncologist and chemical biologist at Dana-Farber and Children's Hospital Boston. He is the senior author of the report being published June 20 on the website of Nature Chemical Biology. The first author is Michelle Stewart, a graduate student in the Walensky lab. The researchers showed in lab experiments that combining the MCL-1 inhibitor with a class of conventional agents that can be rendered ineffective by MCL-1 resensitized the cancer cells to the drugs. The MCL-blocking compound is now being advanced to testing in animal models. MCL-1 belongs to the BCL-2 family, a yin-and-yang collection of proteins that control the process of apoptosis, which is designed to rid the body of unneeded cells during embryonic development or cells that have become damaged or cancerous. The "pro-death" BCL-2 members form a pathway that triggers cellular self-destruction, while "pro-survival" members - of which MCL-1 is one - establish blockades in the death pathway, often by binding to pro-death proteins and disabling them. Cancer cells exploit the survival pathway by over-expressing anti-apoptotic proteins such as MCL-1, which makes chemotherapy drugs less effective. Developing drugs to specifically target survival proteins like MCL-1 has been challenging, but Walensky has been making progress on that front. A small, coiled peptide unit called BH3, which is known as the "death domain," is a key interaction point between pro- and anti-apoptotic proteins. Walensky previously showed that an isolated BH3 coiled structure could be reinforced by chemical "staples" and targeted to the BH3-binding domains of BCL-2 survival proteins, causing the cancer cells in which they are overexpressed to self-destruct. BH3 domains differ in subtle but important ways from one another, like a set of keys for different locks. Walensky said that molecular mimics of these domains are showing great promise in early clinical trials, yet most of these drugs block three or more BCL-2 family proteins, rather than homing in on one specific cancer-causing target. "An ideal pharmacologic toolbox would contain agents that target individual BCL-2 family proteins, subsets, and all members," explained Walensky, who is also an assistant professor of pediatrics at Harvard Medical School. In the current research, Walensky and Stewart searched through BH3 domains in cells hoping to find one that could bind to MCL-1 - but no other protein - and serve as a specific inhibitor of this formidable cancer protein. After combing a collection of BH3 domains, it turned out the one they were looking for was right in front of their eyes - the BH3 domain of MCL-1 itself. The helical BH3 domain of MCL-1 is located within a small "pocket" in the protein structure, and acts as a dock to enable binding of other proteins. It is by means of this docking unit that MCL-1 "traps" pro-death proteins and keeps them from triggering apoptosis in cancer cells. 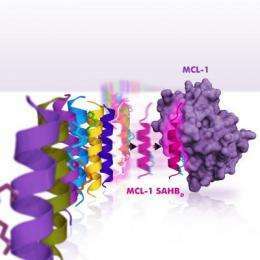 The scientists didn't expect to find that MCL-1's own BH3 domain could, when inserted into the pocket, inhibit its own pro-survival behavior. "When we uncovered nature's solution to selective MCL-1 targeting, we were surprised by the ironic twist," said Stewart. The Dana-Farber investigators were also able to analyze the three-dimensional structure of the key parts of the MCL-1 docking mechanism and discover why it binds so specifically to its target. "Our data provide a blueprint for the development of novel therapeutics to reactive apoptosis in diseases driven by pathologic MCL-1-mediated cell survival and chemoresistance," they wrote.